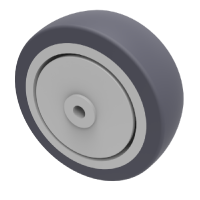 Grey Polyurethane rubber on polypropylene wheel with ball bearing. Wheel diameter 100mm, tread width 30mm, Hub width 35mm, Bore size 8mm. Load capacity 80kg.